Veterans Park is newly renovated a 4.7 Acre neighborhood park with a 1 acre lake and new Veterans Memorial Plaza. In March, 2017 the City Council awarded a construction contract for the Village Pond Park Improvement project, designed to update the park and include various design elements to discourage the overpopulation of waterfowl and make the entire facility more enjoyable for the public as a recreational venue. The project scope was for a complete renovation of the park, including the removal of 30+ years of sediment from the bottom of the pond. Some of the major design elements include placing boulders and large shrubs around the edge of the pond which simulate potential predator habitats to discourage nesting, and installing water geysers and a floating island to disrupt the flight pattern of waterfowl. In addition, low perimeter fencing and designated park entry points were added to discourage the drive-up feeding of the waterfowl. The design also included the full renovation of the landscaping adding drought tolerant plants throughout the park, and adding a humming bird-friendly planting area with decorative benches, new park picnic tables and benches. A new irrigation pump station draws water directly from the pond, increasing water turnover and circulation to improve water quality and minimize algae growth. During construction, City Council renamed the park to Veterans Park, and directed staff to add a Veterans Memorial Plaza to the park improvements. The new Veterans Memorial Plaza includes five separate monuments (one for each branch of the service), along with a semi-circular backless bench in the middle of the plaza. The monuments are made of high quality concrete with the name of each military branch and the date it was founded as well as a bronzed emblem of the branch of service. Village Pond Park was a 4.7-acre park with a 1 acre lake constructed in the early 1970s as part of the Lake Forest 1 development. Originally named Village Pond Park the park was constructed in the early 1970s. Care for the park was shared between the city, which the city inherited when it incorporated in 1992, and the Lake Forest 1 Homeowners Association, who maintained the water quality in the pond. The park had an unofficial status as a “sanctuary for birds.” Over a number of years an unmanageable amount of waterfowl began calling the park home, causing the quality of the park to deteriorate due to sheer number ducks and geese fouling the pond and dirtying the walkways. The City retained NUVIS Landscape Architecture to engage the community in the development of a Conceptual Plan to renovate Village Pond Park. At these meetings, the community provided feedback and placed great value on addressing the impact of waterfowl and renovating the surrounding park. Based on the community feedback, the Conceptual Design, and ultimately the Final Design, included the features designed specifically to discourage the overpopulation of waterfowl, improve water quality, as well as other features designed to enhance park aesthetics and usability for the general public. As construction began, during the draining of the pond and removal of the sidewalk around the pond edge, it was discovered that the pond water had seeped under and behind the existing wall and eroded the soil, causing the pond wall and footing to deteriorate and begin to break, as shown in the photos below. Staff reviewed this unforeseen condition with the designer, the lake sub-consultant, and the City’s geotechnical consultant and determined that the pond edge was not salvageable and needed to be removed and reconstructed. The design for new pond included the complete reconstruction of the pond wall, including the addition of an eight foot wide, submerged concrete safety edge to provide a hard surface to walk on, should someone accidentally end up in the water. The design also included a new aeration system to improve water quality, as well as the installation of a new reinforced polyethylene pond liner covering the entire bottom of the pond, ensuring no leakage or undermining of the lake wall will occur in the future. At its meeting of July 18, 2017, the City Council changed the name of Village Pond Park to Veterans Park and directed staff to work with a resident committee to design an appropriate feature to recognize Lake Forest veterans. The addition of the memorial plaza to the park during construction was a challenging feat, requiring expediting the community preliminary process, developing conceptual and final design documents and constructing the plaza, all while continuing the reconstruction of the park and lake. 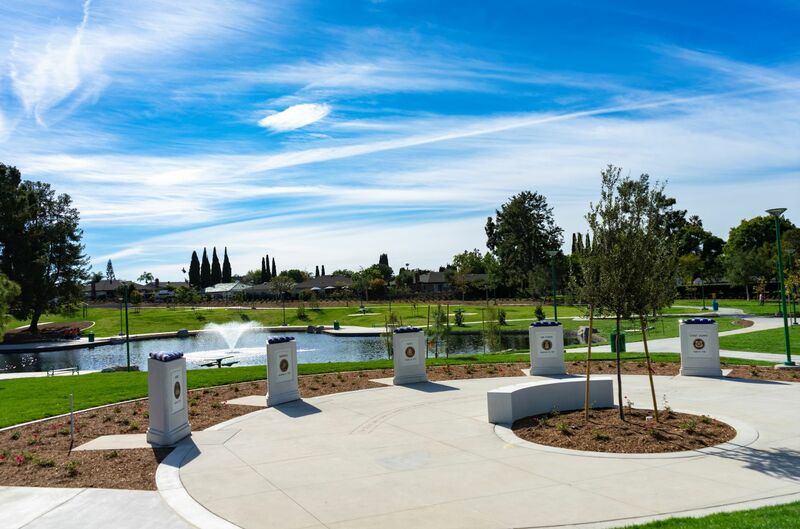 The newly renovated Veterans Park is 4.7 acre park with a completely reconstructed 1 acre pond, drought tolerant landscaping, a humming bird-friendly planting area, and Veterans Memorial Plaza. All these new improvements help make the park a featured destination for residents and visitors to the City. Originally named Village Pond Park the park was constructed in the early 1970s. The park had an unofficial status as a “sanctuary for birds” which over a number of years. Due to the unmanageable amount of waterfowl calling the park home, the quality of the park deteriorated due to sheer number ducks and geese fouling the pond and dirtying the walkways. The park improvement project was designed to update the park and include various elements to discourage the overpopulation of waterfowl. Low perimeter fencing and designated park entry points were added to discourage the drive-up feeding by park visitors. The design also includes new landscaping throughout the park, adding a humming bird-friendly planting area, drought tolerant plants and new park tables and benches. The new reconstructed pond includes a new pond wall with a submerged concrete safety edge and polyethylene pond liner, boulders and large shrubs around the edge of the pond which simulate potential predator habitats to discourage nesting, and installing water geysers and a floating island to disrupt their flight pattern. The park is irrigated via a pump drawing water directly from the pond, increasing turnover and circulation, to help improve water quality and maintain a healthy pond environment. On July 18, 2017, the City Council changed the name of Village Pond Park to Veterans Park and directed staff to add an appropriate feature to recognize Lake Forest veterans. The memorial plaza includes five separate monuments honoring for each branch of the services. The five monuments are made concrete, and each include a bronzed emblem of the branch of service along with the name and the date it was founded.